So yesterday I was out riding around on my bike, doing errands. It was a beautiful day, and not even too hot. A typhoon will do great things for the weather (although it ripped the top of my favorite umbrella right off when Carl tricked me into going out in it on Saturday). I was stopped at a light, and an older, deeply tanned biker next to me started saying “hello, hello” to me. Great, I thought. So much for my dissolving the “bubble of foreignness” when I’m riding my bike. He repeated his question again, and I pointed in the general direction. He nodded. Then the light changed, and he was off. Too bad I was a bit cold toward him (not to mention daft); he was probably a pretty interesting guy, biking through China… and all the way from Thailand(?). Oh well. It was morning. I’m not a morning person. But sometimes interesting things happen when you ride a bike. Would your “survival Thai” been of any help? Ahhhhhhhhh, Thailand, the greatest country in the world for tourists. I’m Chinese so I’m prejudiced when I say China is the best foreign country to live in awhile. However, if I weren’t biased, I would pick Thailand as THE country to be if you want to spend a couple of exotic years abroad as a young person. There are just things in Thailand don’t exist in China! It’s the perfect mix of exoticism and practicality. Yeah, I only spent a couple of days in Bangkok once, but I’d love to visit again one day. My most unexpected “asking directions” moment was when I was walking with a canadian teacher, both of us caucasian, and a chinese bloke on a bike stopped and asked us in chinese how where such-and-such a street was. Both the canadian and I knew enough chinese to understand his question, after asking him to repeat the name of the street, but unfortunately neither of us knew where the street was. My first teacher of Chinese (tall, blond, blue-eyed, the works) favourite anecdote is about as follows. Some fifteen years ago he was walking along a rural footpath in the Qinlin mountains by himself (he’s a birdwatcher) when he saw one of the local 农民 running excitedly at him. And off he ran, looking for his cow. My teacher is cherishing the moment to this day. Imagine being treated as a real, ordinary person in those circumstances! The typhoon was rather weak once it reached Qingdao, it was more like your average English summer rain. How was the typhoon in SH? The most useless phrase that an American tends to close directions with is, “you can’t miss it!” Sure I will not miss it, if 1) I know what IT looks like and 2) I can follow your preceding directions and 3) the directions are all accurate. In your case, esp. with that close-up picture, you could’ve shouted “you can’t miss it, 错不了(cuo4bu4liao3)” after pointing in the general direction from your bike. That will make sure he finds it, or it finds him. The typhoon definitely brought a lot of wind and rain to Shanghai, mainly last Saturday. Quite a few trees were blown down around the city. Eh. If I’d just lost my cow, I’d be a bit preoccupied to notice myself whether the person I’m talking to was black, yellow, green, gray, or pink. Can you guys help me by telling me where can I find a bike rental shop in Shanghai? Is it really that dangerous as written in Lonely Planet guide? ps: Why is John’s mail not working? 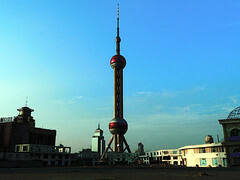 pps: I have tones of questions for foreigners living in Shanghai, and I don’t know where to ask them. Please advise? Thanks. Funny your first thought was that this guy was Chinese. I’ve been setting up a company here in Shanghai (which soon will launch a personal navigation slution for mobile phones) and last week we finally moved over, from Bangkok to Shanghai.